Kapil Sharma seems to have got his mojo back. The second season of The Kapil Sharma Show is a roaring success. The star comedian is back in the thick of things. Everyone is talking about how happy and sorted he looks nowadays and many have credited his wife, Ginni Chatrath for the same. 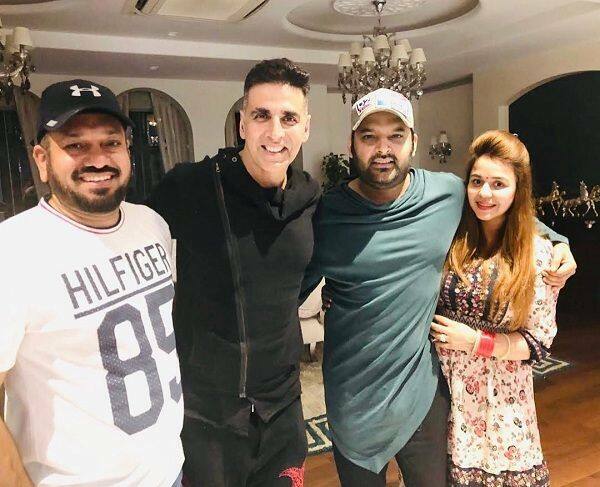 Well, superstar Akshay Kumar paid a surprise visit to Kapil Sharma’s home and he could not be more elated. As we know, Akshay has graced his show the maximum number of times. Kapil shared a picture on his social media handle and also congratulated him on the success of Kesari. Akshay Kumar’s Kesari has got a fab opening of Rs 21.50 crores. The film is doing brilliantly all over India. The actor plays the role of Havildar Ishar Singh who led the 36th Sikh regiment in the 1897 Battle of Saragarhi. The film shows how an army of just 21 soldiers kept 10,000 Afridi and Orakzai tribesmen at bay. Kapil’s show is also going great guns. Stay tuned to BollywoodLife for more scoops and updates!